William Thompson, an Englishman, and his family settled here in 1863. In 1872 he sent to New York for three cuttings called Lady de Coverly of which only one survived. 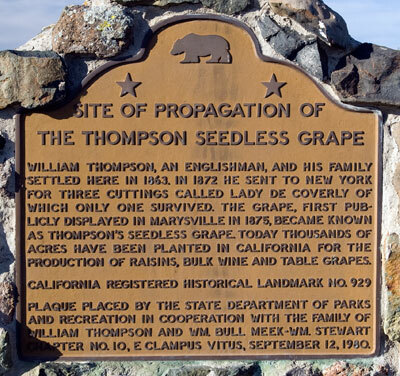 The grape, first publicly displayed in Marysville in 1875, became known as Thompson's seedless grape. 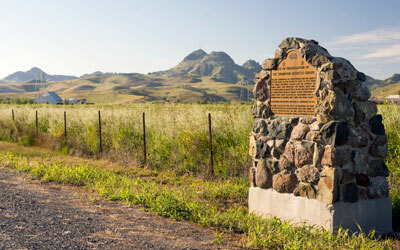 Today, thousands of acres have been planted in California for the production of raisins, bulk wine, and table grapes. Plaque placed by the State Department of Parks and Recreation in cooperation with the family of William Thompson and Wm. Bull Meek - Wm. Stewart Chapter No. 10, E Clampus Vitus, September 12, 1980.